For example, when F1 regulations for on track testing changed in 2008, most teams re-evaluated their spending and some allocated as much as a quarter of their annual multimillion-pound budget toward R&D activities aimed at specialty areas such as pit stops. Case in point: Over the winter break last year Williams dedicated a noticeable majority of their available time to practicing pit stops. Fast forward to now, the 2016 season, and they have already won the DHL Fastest Pit Stop Award, and are regularly posting in-competition pit stop times of ~ 2.0 seconds. It’s a marginal gain in itself, to be sure, but they have successfully leveraged this gain to undercut teams on track due to their speedy service. And the seemingly small time savings from individual pit stops can accumulate and be converted into high place finishes and constructors points. 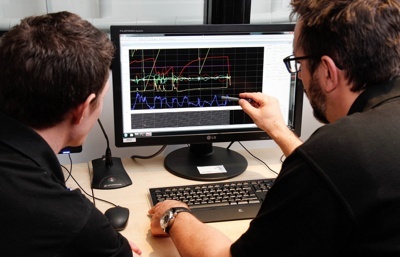 Reduced track testing time for teams can also lead to specialty pursuits behind the scenes, as teams seek new and better simulation tools such as Driver-in-the-Loop (DIL) simulators. But to call the gains made in this realm “marginal” would be to misjudge their impact. The latest engineering class simulators allow drivers and engineers to test and re-test various setups in an immersive and realistic environment, accumulating more miles than might even be possible with unlimited access to real cars on real tracks. Of course, these are virtual miles, but they are valuable miles nonetheless. When Dean Stoneman came in to test drive the Ansible Motion Delta series DIL simulator earlier this year, he relished the opportunity to set the grip level of his car and look at his back-to-back runs. He could analyse his laps, focus on consistency, and take advantage what he was learning in a very short period of time. On track, he would have had, at the most, two laps to develop the car before tyre degradation became a major factor and the car setup would no longer work. But the driving simulator enabled him to push himself and the car lap after lap to extract maximum performance, by actually controlling the rate of tyre degradation and mapping it against tuning settings. The fundamental power of engineering class DIL simulation in sessions such as this is a result of the consistency and quantity of runs (experiments). The controlled consistency of the simulator lab environment means that any measurements extracted from back-to-back runs and repeated runs can be considered with confidence. The quantity of runs means that the tuning changes can be undertaken efficiently, and a large number of setups can be checked in a short period of time. Although, in many cases, large gains will naturally and overtly emerge from DIL test driving sessions, you may find that hidden there – inside the same data sets – are the marginal gains that, when collected together, lead to something significant. The trick is not to overlook them or let them be completely overshadowed by the giants!